A single day: July 4, 1863, brought to a conclusion two of the most infamous battles of the Civil War. In the west, after six months under siege, Vicksburg Mississippi, key to the vital supply lies of the Mississippi River, would capitulate to Union forces led by Gen. Ulysses S. Grant. Gen. Robert E. Lee's response to the siege at Vicksburg, a daring push to the north at Gettysburg, Pennsylvania, would be turned back after three days of violent fighting. As the U.S. flag was raised over the Vicksburg courthouse and the residents of Gettysburg gazed at the destruction that surrounded them, the fate of the Confederacy had been sealed; yet nearly two more years of bitter fighting would remain. 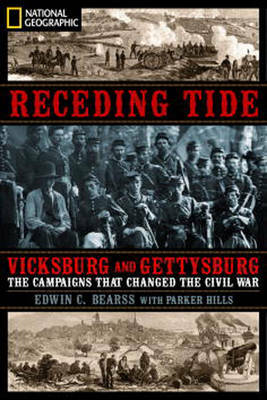 "Receding Tide" tells the story of these two pivotal battles through the unmistakable perspective of America's leading battlefield historian, Edwin Cole Bearss. With an intimate knowledge of terrain, tactics, and the personalities of the characters involved, Bearss draws from his popular battlefield tours to bring the story of these two epic battles - and their dramatic conclusion - vividly to life. As the former chief historian of the National Park Service and a leading expert on both Vicksburg and Gettysburg, Bearss offers readers dramatic new insights and characteristic wit as he tells the fascinating story of this dramatic day in American history.